The original St. Agnes Church building was built between 1905 and 1907. 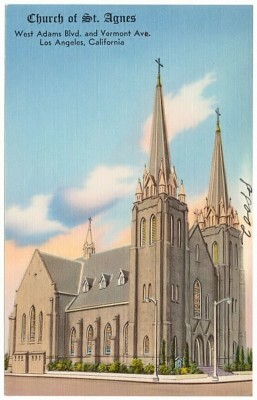 The Gothic Revival ediface was one of the largest and tallest in Los Angeles suburbia. The original church had two 150-foot spires. The building was then demolished and then expanded in 1960 to encompass 13,760 sqaure feet. Saturday: 4 p.m. – 5 p.m.